LAS VEGAS — A vital piece of evidence that could have helped in determining the timeline as to when Mandalay Bay Security Officer Jesus Campos radioed in that he was shot, was compromised, according to a Mandalay Bay Surveillance and Security Officer who spoke to the FBI and the Las Vegas Metropolitan Police Department. 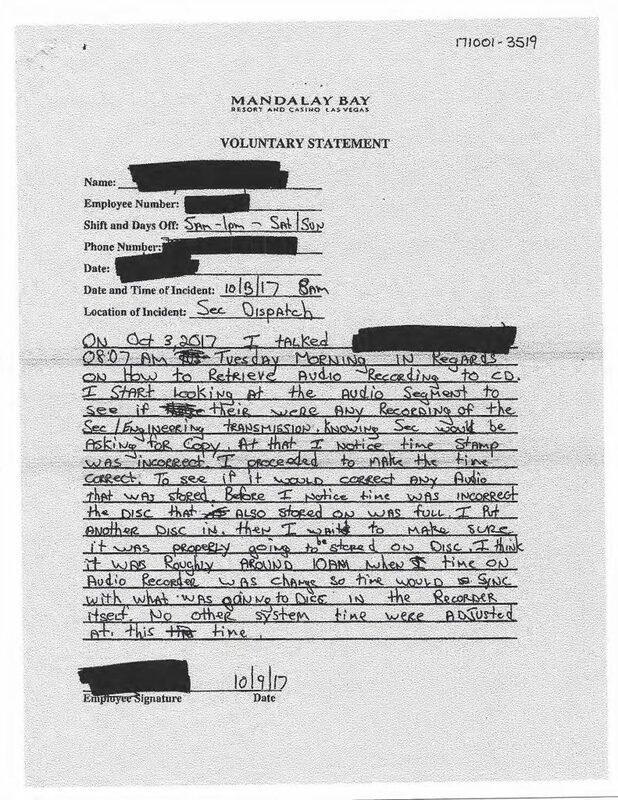 That Mandalay Bay security officer, known only as TB in the transcript of his recorded interview that occurred on October 9, 2017 with FBI Special Agent G. McCamey and LVMPD Detective Breck Hodson, stated that recorded audio transmissions of Jesus Campos and Mandalay Bay Engineer Steven Schuck was off by at least 20 to 30 minutes from the actual time. Remember, both Campos and Schuck called in from the 32nd floor and reported the gunfire. On October 3, 2017, I talked to [redacted] at 08:07 a.m. Tuesday morning in regards on how to retrieve audio recording to CD. I start looking at the audio segment to see if there were any recordings of the security/engineering transmission, knowing Security would be asking for a copy. At that, I noticed time stamp was incorrect. I proceeded to make the time correct, to see if it would correct any audio that was stored. Before I noticed time was incorrect the disc that also stored on was full. I put another disc in, then I waited to make sure it was properly going to be stored on a disc. I think it was roughly around 10 a.m. when time on audio recorder was changed so time would sync with what was going to disc in the recorder itself. No other system time were adjusted at this time. Timestamp was 20-30 minutes ahead of actual time. I corrected time to match the Pelco system [surveillance video cameras] time. I corrected time to match the Pelco system time at that point. I didn’t change the time on Pelco system. During his interview, TB states that he has worked in Mandalay Bay Surveillance and Security for almost 14 years. With that tenure, TB is still unfamiliar with some of the equipment. He also says they have “faulty” equipment and appears to be unsure about policies and procedures. TB tells the FBI and LVMPD detective that he was looking for audio recordings and video recordings from the night of October 1 because he knew the Mandalay Bay investigators would be asking for it. TB is asked if at some point did he start working on some time frames with reference to the radio system. Apparently, Mandalay Bay Security maintains the audio recorders for both Security and Engineering. TB then says during his interview that the PDF instruction manual was emailed to him and that it took about 40 minutes for him to read through it. After reading the manual he still had trouble downloading the audio recordings from the hard drive to a CD. Through trial and error, he finally got it right. Considering the magnitude of the October 1 massacre and the possibility of civil litigation, from a risk management perspective alone, the cavalier attitude concerning the importance and these recordings is disturbing, coupled with the fact that an employee who was inexperienced in the audio recording equipment was handling this. The preservation and downloading of all video and audio recordings should always start immediately after any critical incident. Here is where things go further downhill. Police: On these audio recordings? Police: So, what do you do about the time? TB: I corrected it to our Pelco System which has a stamped time. Police: Did anyone give you any instruction to do that? Police: Is it something you just decided on your own to do? TB: Yeah. Because it’s – normally if something’s off, got to correct it right away so there’s no problem as far as discrep – you know what I mean? Time frame or so. Police: When you corrected the time what happened to the time frame that – of what was recorded? TB: It started syncing. So, it started putting all the audio recording onto that disk. Police: Do you remember the times? From what the original – so even though it would have been off what was the timestamp? For example, with the radio transmission that occurred up in the hallway? TB: Well, it said – it showed it as the 10 – from – when I read it or heard it and the time stamp I think it showed it at around 10:38 the first call was the Engineering. From our dispatch. So, I think it was like 10:38 or 10:33 according to the time stamp. So, and then that was the first call ‘cause they were trying to find out what room the suspect was in. All they knew it was in the 100 wing and our dispatch asked ‘em, “What’s the room number,” and he said he can’t because he was being shot at. Police: So then at that time then you – so you have those – you have those time stamps that are – that are off essentially so. The 2238 time would have been off correct? TB: Yeah, but I didn’t know what time the actual… So, I’m actually assume 10:38 was the first call from our dispatch to him and said, “Oh, something happened on that time.” [He should never have touched the system. He never noted the actual time that it was off]. Police: Now when the time resynced to the correct time did it change the time stamp on that audio recording? TB: On the audio recorder itself, yeah, ‘cause I had to physically change so you’ll see it in the top right-hand corner of the actual unit that it changed. But as far as syncing with that actual segment. I assume it naturally would have. But I don’t know and when you play it on a disk. So. Police: So, you said this is the first time you’ve ever had an incident where you’ve recorded audio recordings and when it’s come to, in relation to a criminal investigation, is that correct? Police: Do you guys have a protocol for that type of thing? Is there a policy or anything that you guys abide by on like when you guys are starting to download things, it would be considered evidence as far as the company’s concerned? Police: Is this something that you notified your supervisor about? TB: Yeah. I mean if I didn’t really think about it because I didn’t know the time was off on there. Until I checked that morning. And then like, oh, it’s off. So, then I didn’t really say anything to my boss about it because I didn’t know what time – I thought about it like so if that time – so what time was the action. I never heard anything about the actual time. If I did then I would have mentioned to my boss right away, “Hey, let you know that audio recording’s off because the actual time, machine, was this.” So, I had no – I assumed it was around 10:30, 10:50, based on what I heard. That the time the shooting was. Police: And so, you changed the times then you burned the audio to a disk? TB: I grabbed more segments because I only did like maybe up to midnight. But I wanted to see – I assumed there would be more critical stuff afterward, so I like I looked further into it and I think I grabbed like up ‘til like 9 o’clock the next morning. When everything kind of died down from what I can hear. So, I grabbed it up to there. Then I started – well, then made a copy and then I gave it to the investigator. They said part of that, he said the Engineering copy was fine but the Security side, he said, “Halfway it cut out or it stopped. I said, “Okay, all right, when I get a chance let me see what I can do, see what happened.” There are sometimes some of the segments got corrupted. So, I’m assuming that’s what happened when I grabbed more files. There might have been some that were corrupted so it didn’t – it stopped it right there. So, then I burned another one with more of the longer segments and then I gave it to the investigator day before yesterday. [October 7]. There was more talk as to why the time stamp was off on the dispatch radio audio recording system. “HOTSOS Is a system that comes up on the computer if a door is ajar from a hotel guest room. Some officers actually call the guest to notify them this is security dispatch, you know, just want to let you know your doors ajar, can you please check it. A lot of times the latch doesn’t click, you can’t push on it. If no one actually answers the call, then we will send an officer to respond to that room to make sure the door is secured.” [Faulty door latches on guest rooms, a lot of times? If true, that is a serious guest safety issue]. “On swing shift, we actually ask the officer to give us an update on each door. I know on other shifts they’ll just say, you know, its taken care of. All the rooms are secured or whether I’m done, give me the next batch of HOTSOS. I know graveyard does that a lot. For swing shift, we actually ask the officers if the security officer closed it, if the door was already locked or closed or if the guest closed it or the guest wants it open. The police were trying to lock down the time Jesus Campos was completing the HOTSOS open door checks. That also went nowhere. It appears they log the calls as handled as soon as the officer gets the room numbers. They never had a standard operating procedure for HOTSOS, the dispatcher tells the police. “I don’t know the system that well, so it’s difficult to go back in to try to actually find that room to update it with whatever the officer said when he called back,” he said. “Upon contact with Security, we attempted to find the hotel service elevator, of which the security officer on hand could not advise on. Mandalay Bay has quite a few issues with Security, to say the least. Let me rephrase that, with security management, training, policies, and procedures.